think:lab: Can I Be On Guinea Pig TV? Can I Be On Guinea Pig TV? Okay, I have the kid. I have a blog. I have the new digital camcorder (thanks to Beckett's grandparents). And I finally don't snicker when I hear someone say, "Have you YouTubed?" So, the next step is to begin daydreaming the media bohemoth I can begin to create with and for my son as he gets older. Why not his own TV station blog! Where will I turn for some too-cute-for-its-own-good suggestions? 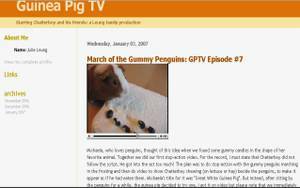 Why, Guinea Pig TV, of course. One family. A couple'o'kids with high imagination quotients. A camera. And a playful instinct for teaching bigger media/technology/story-telling skills regardless of whether we start with gummy bears and real guinea pigs as thespians. Thanks to Scoble for this blog link. Good stuff that guy has a wide radar and a quirky sense of curiosity to go with his razor sharp tech/business/political/media mind.